Some Daylilies are dormant with their foliage dying back completely, others are evergreens, there is also a wide range in between referred to as semi-evergreen. They have tuberous, somewhat fleshy roots and strap or grass-like leaves that arch gracefully making clumps attractive even when not in bloom. for one day hence the name Hemerocallis, “beautiful for a day”. Modern day hybridizing has allowed Daylilies to come in a wide range of colors, shapes and sizes, except blue. Bloom sizes range from miniature to very large, available in single, double, spider and unusual forms. Most Daylilies do best in full sun. They will tolerate part-shade conditions, but require a minimum of six hours of direct sunlight per day to bloom at their best. Daylilies will adapt well to almost any kind of soil and are almost pest free. Daylilies can be planted any time after the ground thaws, however it takes about six weeks for Daylily roots to adjust to a new location so all plantings and transplanting should be done at least six weeks before the ground freezes. If planting a clump, less time is needed as the roots have not been disturbed. Bare-Root Daylilies, especially those received through the mail, should be soaked for a few hours in water. If you want, you can add a weak solution of liquid fertilizer. Dig a hole larger than the root ball, and down at least a foot to loosen the soil. Form a mound in the center of the hole. Set the plant in place with the roots spread on all sides of the mound. 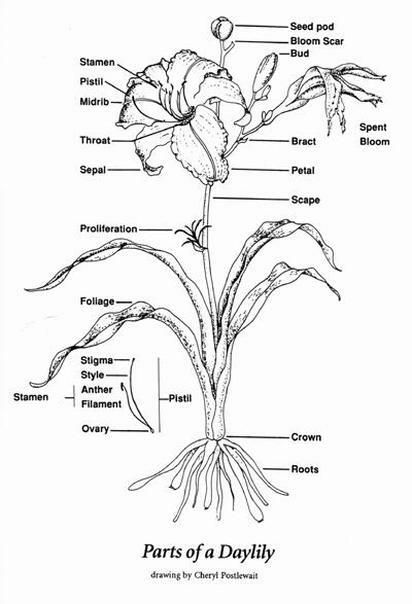 Never plant Daylilies with the crown (where foliage and roots join) more than 1 inch deep. Add the soil around the roots firming it as you go. When the hole is half full with soil, water it very well to insure good soil to root contact, and then add the remaining soil. Firm the soil again, leaving a slight depression around the plant to act as a reservoir and water thoroughly A good mulch of wood chips or leaves will help to preserve the moisture in the summer, as well as helping to control the weeds. Nothing could be simpler, simply dig a hole large enough for the clump to be planted. Put water in the hole, add the clump and replace the soil over and around it. Press firmly around the diameter to be sure to eliminate any air pockets. Water well and add mulch if desired. As Daylily clumps grow over the years, it will become necessary to divide and separate the plants. If clumps are allowed to grow too large, plant performance will suffer and over crowded clumps will have fewer blooms. Daylilies can be divided every three to four years. Some prefer to transplant in early spring, but you can also transplant after bloom season, when the days grow cooler. Dig the entire plant up and gently pull the leaf fans apart, with each division having a minimum of 2 fans. In large clumps it may be necessary to cut the division with a sharp long blade knife. A favorite tool for dividing Daylilies is an old screwdriver. Stick it into a space where it looks like it could easily be divided and twist and turn to loosen a division. Using a digging fork to dig clumps, makes the job a lot easier on both the plant and the gardener.